Today, many people associate mistletoe with the plastic decorations that people hang over their doorways at Christmastime. Real mistletoe, however, is a fascinating plant with a parasitic nature. Because of its ability to feed off of other trees, mistletoe was regarded by ancient civilizations as a special plant with mystical properties. While many people prize mistletoe for its decorative qualities, the plant actually is an invasive parasite. Mistletoe can grow on its own, but it is more commonly found growing off of a host plant. Mistletoe can grow on any deciduous tree, but tends to favor the soft bark of apple trees, ash, lime and hawthorn trees. When a mistletoe berry lands on a host tree it sends out roots that penetrate the branch of the tree to feed off the nutrients. Mistletoe will not directly kill a host tree, but since it does deplete the host of its nutrients, it can contribute to the poor health of the host. You can identify mistletoe by the appearance of its signature round, white, sticky berries. When in bloom, mistletoe forms small yellow flowers that appear in clumps of three. The leaves of the mistletoe plant are thick, tongue-shaped and yellow-green in color. They appear in pairs and grow to be about 3 inches long. The stalk of the plant, which embeds itself in the host tree, becomes thick and woody once the mistletoe is mature. Mistletoe is of the botanical genus Viscum, which includes at least 30 species. 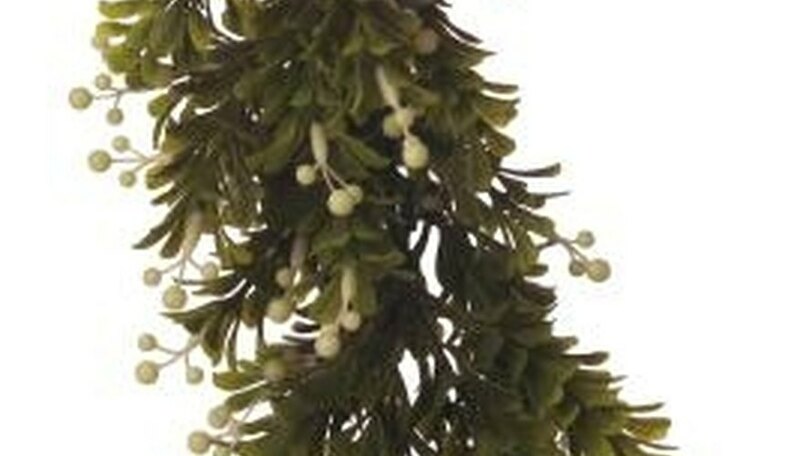 There are two varieties of mistletoe that are the most common, however. The North American variety, which grows along the east coast, is the type most commonly used as a Christmas decoration. The other main variety of mistletoe grows as a larger shrub and is common throughout Europe. Because of its parasitic quality, civilizations dating back to the Greeks have considered it to have mystical properties. Some cultures, including early Europeans, considered it a symbol of fertility and sexuality. Today, mistletoe is used as a decoration at Christmastime, usually hung over a doorway. If a couple find themselves standing in the doorway underneath the mistletoe, tradition dictates that they must share a kiss.